When the Hungarian Chair of the University of Toronto was inaugurated in 1978, its incumbent, professor George Bisztray, began to assess the expectations of the Canadian academy and the Hungarian Canadian community. Since the early 1970s he had been a member of the American Hungarian Educators’ Association (AHEA, based in the United States), and invited this association to hold its annual meeting at the University of Toronto in 1980. The number and quality of the papers, and the interest of the Hungarian Canadian community in the meeting, encouraged professor Bisztray to organize a second conference in 1983. About a hundred people attended this event, and the Canadian participants expressed their wish to establish a scholarly organization which, similarly to AHEA, would represent Hungarian culture and history at an academic level. Two university professors accepted the challenge. In 1984 Robert Blumstock, sociologist at McMaster University, Martin Kovacs, historian at the University of Regina, and George Bisztray met at the University of Guelph. By that time an umbrella organization called Learned Societies Conference had provided opportunity for many years to a hundred or more academic associations of Canada to meet annually at different universities. The 1984 conglomeration of these conferences was held at Guelph, which gave the idea to the three professors to meet there. They discussed what the name of the Hungarian association should be, how it could become a member of the Learned Societies, who would develop the constitution, and how to announce the existence of the new association. The first meeting of the Hungarian Studies Association of Canada (HSAC) was held in 1985 at the University of Montreal. Twenty papers constituted the program, and they helped to crystallize a policy for future conferences. It became clear that the Hungarian origins of a participant did not justify a paper about a philosophical or non-academic topic, or one that had nothing to do with Hungary. In other words, a seemingly rich program which was poor in Hungarian substance could not be the goal of the association’s future conferences. 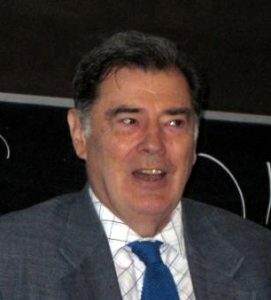 At the first General Meeting, professor Kovacs presented the draft of the constitution that he developed based on the constitutions of other associations. The membership voted to accept the draft which was printed in its final form in the winter newsletter, and has been amended twice since. The newsletter was first published in the fall of 1985 under the title News in Hungarian Studies, and has appeared 3-4 times a year to inform the members. The average membership has been about fifty. The concentration is in Ontario and Quebec, two provinces where the most Hungarian Canadians live. Similarly to several community associations, rejuvenation and augmentation of the membership has been a chronic problem. 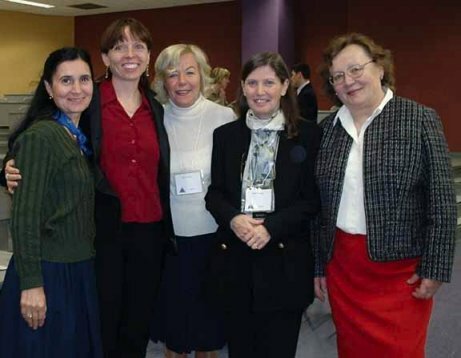 Some of the conference participants at the May 2005 conference of the Association at the University of Western Ontario in London: L to R: Prof Maria Palasik, Budapest University of Technology and Economics; Prof Agatha Schwartz, University of Ottawa; Prof Eva Kiss Novak, University of Szeged; Judy Young, CHEF; Maria Tiltins, Toronto. The annual conferences have taken place under the aegis of the Learned Societies Conference (since 1998 called Congress of the Social Sciences and Humanities). Some of the conferences had joint organizers: the Finno-Ugric Studies Association of Canada and the American Hungarian Educators’ Association. Announcement of the annual meetings and coverage of their program appeared regularly in the Hungarian Canadian press, and occasionally in the European press. Not counting the joint conferences, participating guests of the HSAC conferences have come from six countries. Since 1974 an internationally noted, refereed academic journal, the English language Hungarian Studies Review has represented Hungarian scholarship world-wide. This journal has been affiliated with the HSAC for many years and paid up members of the Association receive its volumes as part of their annual membership. In 1990-91 the HSAC and the journal entered into partnership with Hungary’s National Széchényi Library to co-publish this periodical. This latter set up a home page for the Hungarian Studies Review on which the entire text of the journal’s issues between 1998-2001 is available. For many years the Review has been ably edited by Professor Nandor Dreisziger of the Royal Military College of Canada. The Association also has two series in which only members can publish. One is titled LECTURES AND PAPERS IN HUNGARIAN STUDIES, which includes selected working papers, research reports, lectures and other essays. Thus far 46 issues have appeared and deposited in five major libraries world-wide. The other series, DIVERSIONS, prints non-academic essays, literary and poetic works.